In a stand of barren trees in Edmonton's Alberta Avenue neighbourhood, 40 red dresses, suspended from branches, sway silently. The red dresses are meant to represent Canada's missing and murdered aboriginal women, says Lori Calkins, the artist behind the new outdoor art installation on the corner of 92nd Street and 118th Avenue. 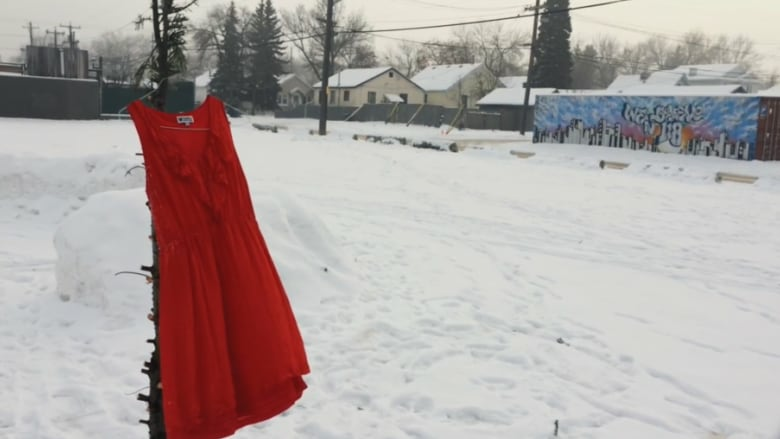 In a stand of barren trees in Edmonton's Alberta Avenue neighbourhood, 40 red dresses have been suspended from shorn branches and left to sway silently in the street. The dresses — which encircle a bare, uncovered teepee — are meant to represent Canada's missing and murdered aboriginal women, says Lori Calkins, the artist behind the new outdoor art installation on the corner of 92nd Street and 118th Avenue. "Each of the dresses represents about 30 missing and murdered aboriginal women and girls, and their families," said Calkins during a Monday morning interview on Edmonton AM. Calkins, a Métis woman and Anglican priest, says the dresses are meant to act as a striking reminder of the ongoing epidemic, and an act of reconciliation. "We hope that people will see that there are hundreds of indigenous women and girls that have gone missing or have been murdered in this country," Calkins said. "Indigenous women are not being valued and that needs to change." "We want people to recognize that indigenous women are so much more than the negative statistics that we see in the news," said Calkins, who drew inspiration from Jaime Black's REDress Project. "Art, I think can engage people, their hearts and their imaginations, in ways that information on its own just can't." Calkins describes the project as a community collaboration. More than 20 local writers shared their messages of reconciliation, which have been hung in the trees alongside a series of traditional teachings from indigenous community elders. The Bleeding Art Space helped execute the display, and the gallery will be hosting a series of exhibits, talks and workshops in conjunction with the tribute, including kâ-katawasisicik iskwêwak, an indoor exhibit by Lana Whiskeyjack from Saddle Lake Cree Nation. "The trajectory of this project is towards hope and reconciliation," Calkins said. "We hope people will see the beauty, dignity and strength of indigenous women." The opening ceremony for Ni Wapataenan was held Sunday, and the interactive installation will remain in place until March 5.